As you have probably noticed, there is a lot of yoga out there! As yoga and fitness studios continue to open and close, I find it increasingly important for us to understand the practices in more depth – focusing on the history, lineages, science, and testimonials of practitioners. For practitioners of Bikram Yoga, Ghosh lineage yoga, and hot yoga – or for those interested in trying them – here are the most basic distinctions and history. Ghosh’s Yoga of Physical Education was founded in 1923 in Kolkata, India, by the late Bishnu Charan Ghosh. It was then named Ghosh’s Yoga College in 1970 and currently operates under the direction of Bishnu Ghosh’s granddaughter, Muktamala. Bishnu Ghosh (1903-1970) was the younger brother and disciple of the world-renowned Paramahansa Yogananda (1893-1952; founder of the worldwide Self-Realization Fellowship and author of Autobiography of a Yogi). Ghosh Yoga has a fascinating history of meditation, breathing techniques, showmanship, physical culture, asana, bodybuilding, therapeutic exercises, medical research, and individual prescription of exercises and asana. The Ghosh lineage has been transmitted worldwide primarily as Bikram Yoga, via Bikram and Rajashree Choudhury, and their trained teachers. At the same time, Ghosh Yoga in its broader expression of asanas and therapeutic exercises is being taught in North America and Europe by Tony Sanchez and his trained teachers, including Ida Jo and Scott Lamps. Ida Jo and Scott have completed Muktamala’s Therapeutic Training program as well as many other yoga trainings and are now the North American administrators of the therapeutic training program at Ghosh’s College. They have published the Beginning, Intermediate, and Advanced Practice Manuals in the tradition. You can read more about Ghosh Yoga at Ida Jo and Scott’s website. Bikram Yoga refers to the standardized beginning sequence of Ghosh lineage therapeutic postures, as distilled and taught by Bikram Choudhury (b. 1946) and his students. Mr. Choudhury was one of Bishnu Ghosh’s students in Calcutta in the 1960s and brought his teaching to the United States in the early 1970s. He taught primarily in Southern California until 2016. Bikram and his former wife (Rajashree Choudhury) and senior teachers have certified approximately 4000* teachers to teach in that time. Bikram Yoga is commonly also known as the 26&2 (26 postures and 2 breathing exercises) and is taught at independently owned yoga schools all over the world. It is traditionally practiced in a room heated to about 105 degrees F and 40-45% humidity. Over the decades, it has been found that the heat provides an increase in the circulatory benefits via the “tourniquet effect”. The postures, when done in order and with the correct technical intent, create a combination of transformative effects on the nervous system, the endocrine system, digestive system….well, the entire human system. Bikram Yoga has been researched in many interventional studies and has been proven to reduce muscular stiffness, balance blood sugar, improve cardiovascular function, and improve stress tolerance, among other health benefits. Although these schools have traditionally been named “Bikram Yoga”, they are truly independent and not part of a corporation, chain, or franchise (despite what most media sources and the official Bikram Yoga website report). Rather, they are owned and directed by teachers who were trained and certified by Bikram and his most senior teachers, and who have committed to upholding the techniques and methods of Bikram’s beginning yoga system. Many Bikram Yoga teachers and experienced students also practice the intermediate and advanced postures and sequences of the Ghosh lineage, taught in various manifestations by Bikram Choudhury, Tony Sanchez, and others. 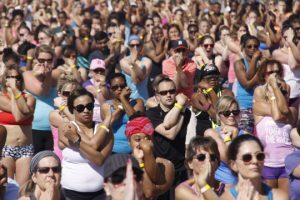 Bikram Yoga students from around Michigan come together for the 2016 Yoga on the River event in Downtown Detroit, Michigan. How does this relate to “hot yoga”? Bikram Yoga is known as the Original Hot Yoga, because it was the first – and, for a time, the only – yoga class taught in a heated room. Many other unrelated yoga and exercise traditions began to add heat to their rooms over the decades, so “hot yoga” and Bikram Yoga are no longer equivalent. “Hot Yoga” can refer to any movement, asana, or exercise class in a hot room and is not necessarily related to the Bikram or Ghosh lineage. Former Bikram Yoga schools that have removed the word “Bikram” and now use “Hot Yoga” in their school names. These still teach the traditional Bikram method and usually have lineage-trained teachers. Some have added other types of yoga or fitness classes, and some have not. Other hot yoga studios that do not have a connection to or training in the Ghosh or Bikram Yoga lineage. They might have teachers in a lineage from a different part of India, but most are not directly descended from an Indian yoga tradition. Many feature classes with a combination of yoga postures, dance, exercise, weights, barre, or music classes. We realize it can be a bit confusing, so we always recommend researching the specific training lineage of the owners of the schools you are interested in practicing at. Another way that you can find a Bikram-lineage school – owned by a Bikram-trained teacher – is on the directory of the Original Hot Yoga Association website. For an easy-to-read-and-share link, check out our handy comparison chart here: Bikram Yoga vs. Hot Yoga. If you are interested in experiencing the benefits of a Ghosh lineage and/or Bikram Yoga practice, let us know if you need help finding an experienced teacher or lineage school.